All are welcome to worship in our Sanctuary! During the summer, please join us for our one service at 10:00 AM. From Memorial Day to Labor Day, we celebrate together with one worship service at 10:00 AM. Beginning the Sunday following Labor Day, we return to our two service format at 9:00 and 11:00 AM. 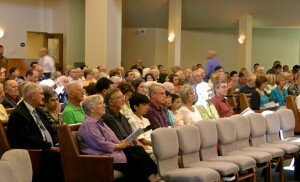 Our 9:00 Spirited Traditional service features our choir and organ music and a traditional worship order. Our 11:00 New Horizons service features music by Anchored in Faith, our band. The service also includes the use of video projection and themes woven into the worship order. Together, we celebrate Communion on the first Sunday of each month. 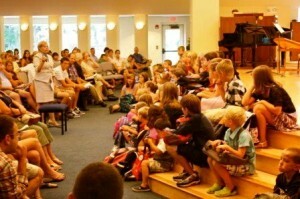 A Children’s Message (Children’s Time) is a part of every service before the kids go to Sunday School.